VietNamNet Bridge – The Quarter Safeguard team for firefighting in Nguyen Thai Binh Ward in HCM City’s District 1 is often called for help by locals. 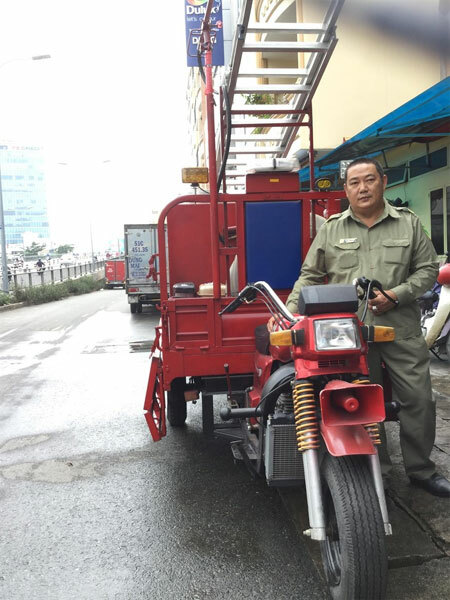 The vehicles are self-modified into mini fire engines, an initiative by Ly Nhon Thanh, the team’s head. In 2002 Thanh was one of first to rush to the rescue when the blaze broke out at the International Trade Centre in District 1. The fire claimed 60 lives, but he said he saved 97 people. “The vehicle, only 1.3m wide and 1.8m long, very easily reaches fires in houses inside long, narrow alleys,” Thanh says. “The agent especially renders toxic smoke discharged by fires non-toxic. It is very important because many people die due to toxic smoke,” Thanh says. These mini firefighting vehicles were used recently to put out a fire aboard a bus on Ong Lanh Bridge in District 1. Thanh says he hopes never to use his equipment to extinguish fires because he just does not want a fire to break out. Thanh has been honoured for his services. Bui Van Quyen, vice chairman of the Viet Nam Invention Association, hailed Thanh’s initiative for its high practicability. Thanh’s team’s brief is to maintain social order and regulate traffic on the streets. He has personally helped catch thieves.